Then retry the PolicyPak operation. NOTE: Troubleshooting Group Policy Replication problems is beyond the normal PolicyPak tech support, since it’s not specifically a PolicyPak issue. If you have a replication problem, here is our suggestion to help you overcome replication problems. Warning: These tips are USE AT YOUR OWN RISK, since Directory Services troubleshooting is beyond the scope of the PolicyPak troubleshooting support team. Symptoms: Everything might be running smoothly until you get inconsistent results upon clients when your PolicyPak directives embedded within GPOs. Some of your workstations are receiving the GPOs others aren’t. While we don’t want to completely rule out PolicyPak’s engine, it’s more likely an Active Directory replication problem. And, it’s also possible that your clients may even utilize a DC located at another site! Therefore, if your DC’s aren’t replicating correctly, than the SYSVOL directories hosted on them may not have precisely mirrored data that they should have. This means that your workstations will get different results, depending on which DC it is directed to. Here are some great troubleshooting tips however. You should always begin by running gpupdate from the workstation that is experiencing inconsistent results. If you get a failure notice such as the one below, than there is a GPO delivery problem at large. Note: It’s very possible the first GPO to express an error one that contains PolicyPak directives. But it’s equally likely that it’s another GPO as well. 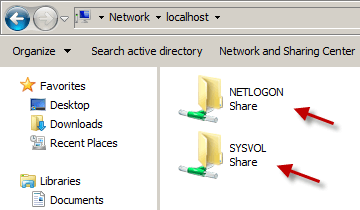 At the most basic level, a DC should have two shared folders by default, NETLOGON and SYSVOL. If you do not have these two folders, you have an AD problem and GPOs will not be delivered from it properly. DCDIAG.exe – The DCDiag (Domain Controller Diagnostic) tool will analyse the state of the domain controllers and services in an Active Directory forest. DCDiag is a very good general-purpose testing tool for checking the health of the AD infrastructure. The available tests include replication errors, domain controller connectivity, permissions, proper roles, and connectivity, and other general AD health tests. Click HERE for more information about this command. You can force replication with this script. Note that it requires a download from the Windows AD Support Tools first. DFSDIAG.exe – This tool checks the domain controller and name server configurations of your AD structure. Dfsdiag /testDCs is especially relevant. Using the troubleshooting tools above, if there is a replication problem, you should be able to determine which DC or DC’s are the problem. Once this is determined you will have to rebuild the system volume (SYSVOL) on these designated servers. If you have more than one DC at a site, an easy way to do this is to simply demote the problem DC by running DCPROMO – reboot the server – and then run DCPROMO and reboot once more. For those who only have one DC residing at a site, or those who are comfortable making registry edits, you can use the Burflags registry entry to rebuild the SYSVOL. Know that demoting the only DC residing on a site may (and I mean may) require you to rejoin the clients to the domain again. Here is a decent walkthru to help troubleshoot and repair replication issues. How to call Microsoft for help. You may also refer to these other articles as well.